You'll never have to leave behind essentials again. With Eagle Creek Pack-It luggage organizers, you'll be able to pack everything with ease. 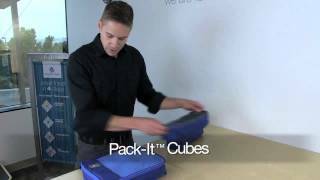 This system revolutionizes the way you pack with garment folders, cube sets, organizers and compression sacs all designed to maximize your packing space, with added benefits such as wrinkle control and moisture and odor protection. There are even organizers for tech gadgets, outdoor gear, toiletries and more. The Eagle Creek Pack-It system can be purchased as individual pieces or as sets so there's a size and style for everything. So pack what you need, you'll be able to take what you want with this space-saving system.